Published Aug 15, 2014 by Que. Part of the Que Video series. Learn how to make the most of Microsoft OneDrive: get and share access to your files, anywhere, anytime, from practically any device! Using Microsoft OneDrive, you can safely store your files in the cloud–and instantly access or share them, anytime, anywhere, from practically any device. These easy video tutorials show you how to make the most of OneDrive in both your personal and business life, and set it up for maximum convenience and efficiency. 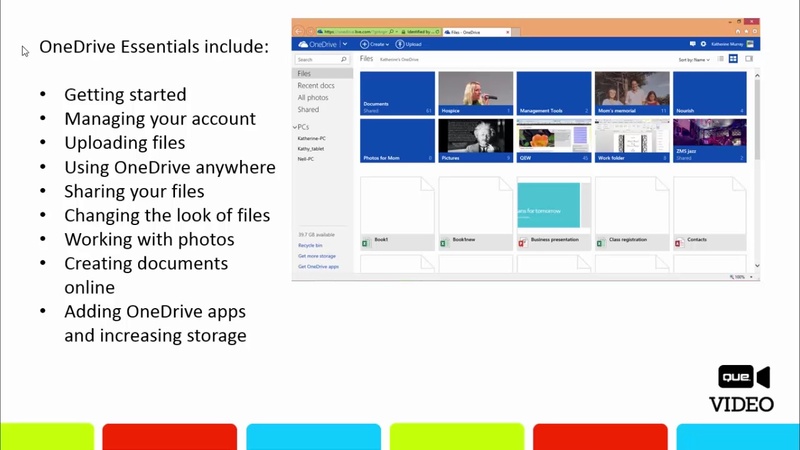 Personal technology expert Katherine Murray guides you through setting up your OneDrive account… creating, saving, and organizing your files… sharing content with the people you want to see them (and nobody else)… using OneDrive to manage photo and video… creating and editing Microsoft Office files within OneDrive, and more. You'll learn how to add low-cost storage and features whenever you need them, and use OneDrive from any smartphone or tabletincluding Apple and Android devices. Katherine Murray has been writing about technology for 25 years, and specializes in Microsoft products, especially Windows and Office. She has written extensively about web products, and wrote a tutorial on SkyDrive (OneDrive's predecessor product) for Microsoft. Her recent books include My Windows 8.1, Microsoft Office Professional 2013 Plain and Simple, and Microsoft Word 2010 Inside Out. 1.2 What do I need to use OneDrive? 1.3 What kind of things will I store in OneDrive? 1.4 What do I need to get started? 3.1 How will you organize files?